Paper quality is very important when using the Cutout Maker. Using cheaper quality construction paper can cause tearing and ripping instead of a clean cut. Make sure you select the correct paper type when setting up a cutting job. Selecting the wrong type can damage the cutting mat or ruin your paper. Be sure to line your paper up against the top left corner to ensure a straight and accurate cut. Help, the machine is giving me an error, what do I do? Let someone know at the IMC desk. Errors can happen, and they are usually easy to fix. I don't have my own paper, can the IMC give me some? At this point the IMC does not offer construction paper to students. Please make sure to bring your own. Welcome to the Digital Cutout Maker guide. Where is the Die Cut Room? 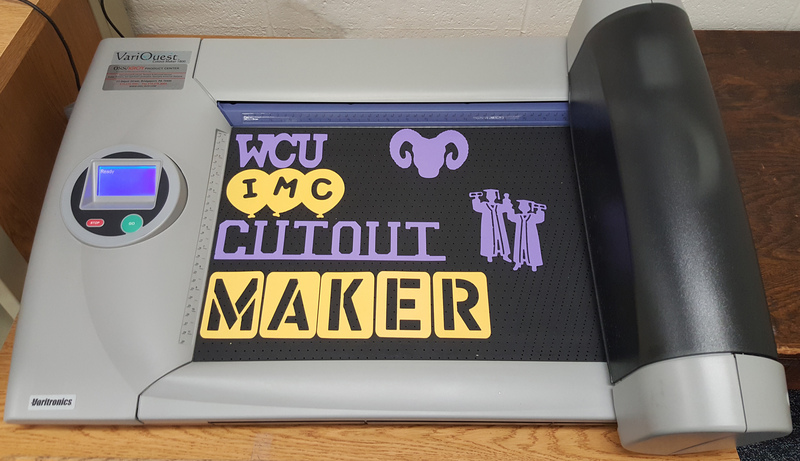 The Cutout Maker can be found in the IMC room 104 with the manual die cuts. Directly to the left of the help desk when you are facing the desk. Using the Cutout Maker is a great idea for cutting out letters for posters, decorations, or other projects. When you use our Cutout Maker you have a lot of options for cutting out letters. You have a choice between 14 different fonts, one of which can be used for Spanish letters, and they can all be resized to fit your needs. You also have two options for cutting out words with all the letters connected removing any worry about lining them up, and you can see examples in the above image. Using the Cutout Maker is easy, fun, and fast. After selecting Cutout Maker, and then Letters, Numbers & Symbols, follow the instructions on the screen to have your letters cut out. Connect Letters: Every letter in the same word will be connected by moving the letters really close together. Add Bar: Connects all your letters with a bar along the bottom so you don't have to worry about lining them up. Using the Cutout maker is also a great idea to cut out shapes or activities for classroom or other uses. Choose from over 3,800 shapes and 172 collections designed to support classroom curriculum. With seasonal and holiday themed cutouts and displays it's easy to decorate a classroom or make fun holiday activities. All of the shapes are easy to scale to any size you want. After selecting Cutout Maker select Shapes or Collections and follow the instructions on the screen to have your shapes cut out.